Christmas toys are always attractive offers from the holiday catalogues like this one. 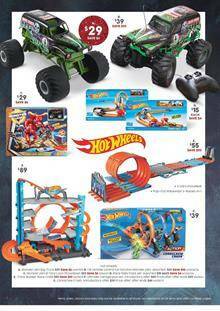 Target Catalogue Christmas toy sale offers Hot Wheels toys. Grave Digger RC Car, race crate, city ultimate garage are among the Hot Wheels sale on that part of the catalogue. Check out Target Tonka deals on next page to this. Disney Pixar cars, super dump truck, Transformers characters are the fun that you can find in the toy sale. Mecard deluxe Mecardimal figure priced at $49 is one of the amazing deals from the latest catalogue. Check out pg 11 where WWE figures including retro action figure, ex-jumbo mecardimal figure and more are also featured. Beyblade Burst toys with the basic stadium, Single tops, and evolution switch strike starter pack are featured products, too. You may find more RC vehicles and cooler ones of racing toys on pg 12-13. Disney toys and plush dolls like FurReal and Hatchimals are among the products from pg 14-15.